The Herakles Pro by Sense is one of the most controversial atomizers to come out in recent years. In some ways, it is quite a shame because it really is quite a good sub-ohm tank. This is, if you were one of the lucky few who had one of the first releases that were not problematic. It is much like the Greek mythical hero that is the tank’s namesake. The Herakles Pro subtank had to go through quite some challenging times before it became one of the most popular tanks made by Sense. By all accounts, they made the Sense Herakles Pro Subtank to become the best of all the tanks that used the Herakles chassis. For example, it had an expanded juice tank, and it came with Sense’s new ceramic coil-heads. As a result, this meant that the Herakles Pro provides a longer, more flavorful vaping experience. This is if only it did not leak like the Niagara Falls. The trouble began when several popular YouTube vape reviewers noticed that when they installed the 0.4-ohm coil-head on their Herakles Pro Subtank. It would work just fine for the first couple of hours. However, problems start if you accidentally left the juice control open and you leave it like that for a couple of hours. As a result, all the remaining juice in the tank would flow out through the bottom airflow. The mystery here is that no one could ever figure out why it happens. There were no issues with the O-rings and the tank did not lose any pressure. Furthermore, it was not because the juice was too thin (even 80 VG blends leaked). Admittedly, the leaking issue seemed to happen to some of the tanks from the first production run of the Herakles Pro. Then, since that time, Sense recalled all of their defective products. After, they released an upgraded version (v1.5) that addressed the leaking issue. If you were to buy one now, it won’t have the same leaking issues that plagued the previous version. However, in some ways, Sense was able to fix the mysterious problem plaguing the first run of the Herakles Pro Subtank. However, was it enough to salvage its reputation and give this quite excellent tank the popularity it deserves? What’s in the Herakles Pro Subtank Box? The Herakles Pro Subtank comes in a plain, clear plastic box with a cardboard outer sleeve. On the outer sleeve, you will find some of the basic information about the tank. In fact, you will find the ever important authenticity code. The Herakles Pro Subtank comes in three different color options. They are black, rose gold, and stainless steel finishes. The black finish looks as if it was cera-coated onto the stainless steel frame. Therefore, it is quite durable (you can clean it using an ultrasonic cleaner and the finish will not chip). Unlike the previous versions, the Herakles Pro is quite a stout little tank. However, it still manages to have a respectable juice capacity. Design-wise, the Herakles Pro looks quite unusual. The Herakles Pro bulges outward around the glass tank section. This is unlike other tank atomizers that have the same diameter from the base to the top cap. This may put off some users, but in my opinion, it actually looks neat. The base diameter is 22mm, bulges out to 23.5mm at the tank section, and tapers back to 22mm on the top cap. The height of the atomizer from the base to the top of the included drip tip is 65.6mm. They made the tank with four main pieces: the top cap section, the shaft/chimney section, the glass tank, and the base. The top cap and the chimney section screws together to keep the top three sections together. What’s more, the base screws into the bottom section of the chimney. Even though the Herakles Pro Subtank is quite short, it can still hold up to 4.5ml of juice. This is thanks to the bulging tank section. The tank has six adjustable juice ports. To adjust the juice flow, grab the tank section and the base and twist to adjust the opening of the ports. The Herakles Pro has four adjustable airflow holes, and the AFC ring provides just enough tension to keep itself in place. Fully opened, the airflow holes measure 6mm x 2mm. Depending on the coils you use, you can either get a restricted lung hit (1.8-ohm coil) or a wide open draw (0.4-ohm coil). The Herakles also comes with a stainless 510 drip tip with Delrin plastic inserts to keep it from getting hot. You can take off the included drip tip and use your own 510 drip tip if you so choose. The tank has a top fill design; just grab the knurling on the top cap and twist it off. The bottom of the atomizer has a smooth, slightly protruding, non-adjustable, copper 510 pin. The 510 pin does not protrude enough for use in a hybrid top-cap mod. In any case, you should not even use sub-ohm tanks on hybrid mechanical mods anyway. The Herakles Pro Subtank is actually kind of a vessel that Sense made for their new Herakles pro 1.8-ohm coils. Now, you might be thinking that since it is not a sub-ohm coil then it could not produces as much vapor and flavor. In fact, you will be pleasantly surprised at just how well this new coil performs. It has a reverse sandwich wicking design that produces clean, intense flavor. They wrapped the coils in organic Japanese cotton and then covered with a layer of porous ceramic wicking material. The reverse sandwich wicking design is actually quite ingenious. The ceramic outer sleeve allows just the right amount of juice to reach the coils. As a result, it basically eliminates flooding and gurgling. You also don’t have to worry about getting dry hits because the coils are 1.8 ohms. Therefore, they won’t heat up so fast that the wicking cannot keep up. 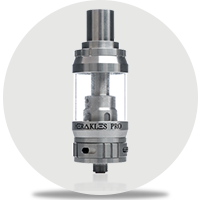 Using the Herakles Pro Subtank is relatively simple, as it just operates the same way that most sub ohm tanks do. To replace the coil, you just unscrew the base, unscrew the old coil-head, and then screw on the new one. First, you need to prime the coils first by putting a couple of drops of e-juice inside the coil. Make sure that you saturate the cotton. Then, you screw the base back into the tank. This will ensure that the coil will wick properly so you can avoid nasty burnt hits. To fill up the tank, you must first close off the bottom AFC ring and the juice flow controls. Once the airflow and juice controls are off, grab the knurling on the top cap and then twist it off. Then, you will fill the tank by pouring e-juice down the kidney shaped fill ports. Be extra careful not to drip any juice down the chimney, as it would flood the coils. Replace the top cap and let the tank sit for around 5 minutes so they saturate the wicks nicely. Using the Herakles Pro subtank with the 1.8-ohm ceramic coil-head is such a joy to use. The airflow has just the right amount of restrictiveness. Consequently, it creates a decent amount of vapor, and the flavor that you get from the coils is amazing. In addition, because the coil-head is not sub-ohm, it does not guzzle juice and does not use up too much of the battery. It is possible to go a whole day of regular vaping without charging if you use these coils on a dual 18650 device. However, do keep in mind that this is not a cloud-chasing coil, nor does it claim to be. Therefore, the Herakles Pro 1.8 ohm coil is for flavor-chasing, and it excels in that department. What I Absolutely Loved About it and What I Did Not Like So Much? Recently, there have since been no reports of the tank dumping out all of its juice. This is after the huge debacle about the first release of the Herakles Pro Subtanks. Therefore, you can rest assured that if you get one now you will most likely enjoy using it. However, just to be sure, ask the vendors if the Herakles Pro subtank they offer are the upgraded ones and not ones from the first batch. The Herakles Pro subtank may be a bit controversial, but it does perform at par with the best sub-ohm tanks out there. If you’re interested in getting one for yourself, here is a link to where you can get the best deal on your purchase. If you are not a fan of towering atomizers, the Innokin Axiom sub-ohm is the only tank you'll need in your life. Read more here. Continuing in the footsteps of the previous Nautilus, the Aspire Nautilus X provides pure, mouth to lung goodness. How does it do that? Find out here.